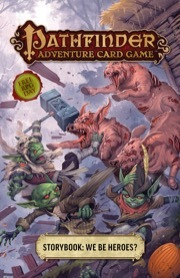 paizo.com - Pathfinder Adventure Card Game: We Be Heroes? The goblins of the Crookedtoes tribe suddenly find their bellies empty and growling for food. Worse, the tribe's best scout has gone missing, and the chief has tasked the brightest members of the Crookedtoes to go out into the woods and find out what happened. While searching for the missing scout, the goblins stumble across a wrecked farmhouse on a hill and discover a group of knights besieged by an undead army. Now, the new heroes must test their mettle—will they fall to the mighty zompigs or emerge as victorious heroes? We Be Heroes? is a Pathfinder Adventure Card Game adventure designed for starting characters. It requires the Pathfinder Adventure Card Game Core Set to play. If you have only the Core Set, you can play this adventure with 1-4 characters. To play with 5 or 6 characters, you will need to either add characters and appropriate boons from an Adventure Path box, or add 1 Class or Character Deck for each additional player. Release: This special 8-page Adventure Card Game storybook was created for Free RPG Day on June 15, 2019. The print edition will be available for sale and a free download will be available on paizo.com beginning July 1, 2019. Sign in to start a discussion about Pathfinder Adventure Card Game: We Be Heroes? !